If you aren't a new customer, and you aren't eligible for the special upgrade plan, the phones will cost 400 and $500 as upgrades, which is pretty rough. Unsubsidized prices run $600 and $700, which, well, ha ha. So, back to the original question! It'll probably replace your pocket camera and Flip cam. The iPhone 3GS, though its camera specs weren't mindblowing, came somewhat close to replacing point-and-shoot cameras for some users. Assuming Apple's kept the clever metering and solid image quality commensurate with the spec upgrades, and assuming the flash doesn't suffer from the same awful whiteout effect that most cellphones flashes do, this camera could quite possibly eliminate the need to carry a P&S or pocket video camera around. Throw in the iMovie video editing software ($5, weirdly) and you've got a pretty wonderful all-around pocket shooter. That screen. So Steve's description of the wonders of the "Retina" display were slightly overwrought—the fact that he resorted to explaining to the audience what pixels are was telling—I can tell you from times with other phones that the experiential gap between 320x480 and 480x854 (like the Droid's or Sprint Evo's) is massive. It doesn't really seem like there are pixels at all. The iPhone's screen is more dense than anything we've seen running Android so far, so expect best-yet visual fidelity here—a huge boon if you read a lot on your phone. It's better at being an iPhone. This iPhone improves a lot on the basics: the battery should last longer, it's slimmer, the antenna is (hopefully) more powerful, it's got noise cancellation, its processor is much faster, and so on. As far as the core features—the stuff that the iPhone has traditionally gotten right—this phone is markedly nicer. If you were considering getting an iPhone before, then you should consider much harder now, but only if you're eligible for a reasonable price. It's still just an iPhone. This is a nice piece of hardware, no doubt. But it won't do that much more than your iPhone 3GS, which will be capable of multitasking, can shoot decent photos and videos, has the same maximum storage options, and operates at the same network speeds. Unless the new camera and flash, screen res and video chat—which is Wi-Fi only, and connects exclusively to other iPhone 4s for now—are things you absolutely need, this is a non-essential upgrade. Apple is the king of incremental upgrade and iPhone 4 is no exception. 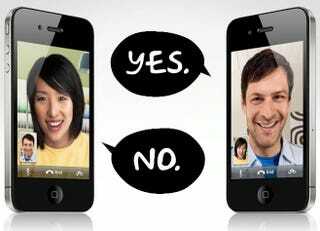 • AT&T: They won't host video calling. They're drawing down data caps. Calls still drop with alarming frequency. And now they're asking for another two-year commitment from you. People have been predicting that the iPhone will be available on another carrier, and it's never happened. But man, it's been three years! And AT&T's giving people an early upgrade option, so maybe they're a little worried? Without a doubt, the fact you must be on AT&T to use an iPhone is the single-most compelling reason to avoid buying an iPhone 4. Android and Windows Phone 7 are looking great. What we saw today is what Apple's going to be selling for the next year, probably. But consider just how much Android has advanced in that time? Android 2.2 is pretty wonderful, and I expect a lot of impressive Android hardware to show up in the next few months, not to mention the forthcoming Windows Phone 7. Think about how you feel today, in terms of enthusiasm. Now try to imagine how you'll feel after six months of what we expect to be relentlessly fast upgrades from Google, and an entirely new OS—and accompanying, varied hardware—from Microsoft. Kind of tempers the magic, no? Apple still doesn't understand the internet. Google does, and so does Microsoft. iOS4 does virtually nothing to address iPhone OS's most glaring weaknesses: lack of social media support and cloud services. They will likely continue to lag for at least a year, until the next phone comes out, and possibly further. Should I Get the 3GS, Now That It's $100? No. If the 3GS is available to you for $100, that means the iPhone 4 is available to you for $200. Don't even think about it.